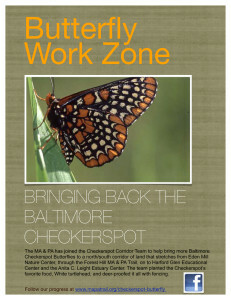 If you see this sign on the Forest Hill Trail segment, near the marshy overlook, our volunteers are working to bring back the Baltimore Checkerspot. Stop us and ask questions. Better yet, join us! Click on the image to download the flier.